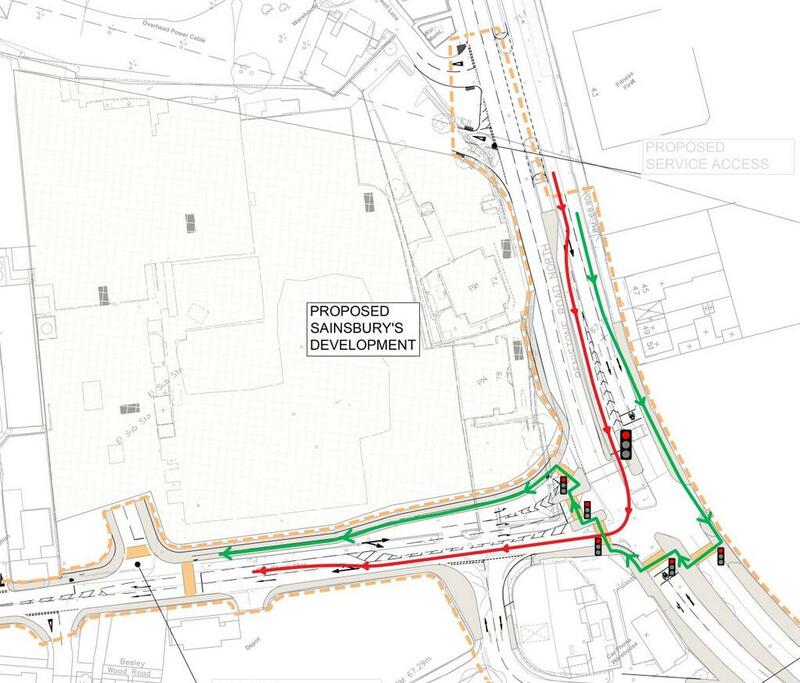 During the past week Sheffield City Council have approved outline designs for the Leppings Lane junction on the A61 in Hillsborough, Sheffield to reduce congestion due to extra traffic using a new Sainsburys supermarket. 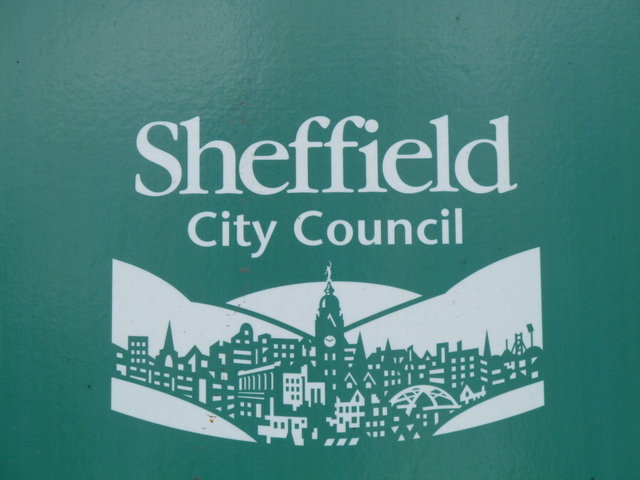 The design was due to be fully approved however issues raised by CycleSheffield meant that the Cabinet Member making the decision was not happy with the provision for bicycle traffic. The design was however approved “in principle” and the council have offered “a future meeting to look into the cyclists’ concerns”. I’m pleased that our concerns resonated with the decision makers however I’m concerned with the attitude that an adequate solution can be found at the very end of the design process after the main highway design is complete and approved. Leigh Bramall, the cabinet member making the decision didn’t seem happy with the design for the bicycle traffic routes and took our concerns seriously. However he was persuaded by the highway engineer present that it was important to approve the scheme now and that the final details of bicycle movements could still be improved upon and that detailed designs (bicycle routes for instance) were still not finalised. I’m not convinced. The main highway design has been completed and approved, bicycle traffic is routed along tortuous shared pedestrian facilities with numerous multiple stage signal crossings. I think there is very little that can be improved upon unless the details up for negotiation include crossings, traffic light phasing, intermediate crossing islands, central reservations and reallocation of road space to bicycles. Looking at a journey from my home near Hillsborough Corner to the store, if I choose to cycle to the store using the proposed routes I will encounter 16 signalised crossings (there and back at these two junctions alone). If I were to drive I would encounter only 4 traffic lights, and half would be green for 60% to 70% of the time. The traffic engineer present agreed with us that confident cyclists will still use the road because it “is more convenient” and said that “the cycle facilities have been provided for safety reasons” (loosely quoted). Perhaps a better reasons for cycle facilities would be encourage and facilitate people to use their bicycle to get to the shops? My belief is that unless bicycle provision is considered and incorporated into the design from the very first stages, the solution will always be inadequate. We’ve been granted time to change the details, but it’s the bigger picture that is the problem. Bicycle traffic is considered last, because as was said at the council meeting “Not many people will cycle to the supermarket anyway”. The many thousands of people who live within 2 km of the store will never choose to cycle if you allow the highway to be designed assuming they won’t. There are drawings showing the difference in convenience between the bicycle route and car/road route. Here are two out of many. Do they look like they can be improved upon by changing the details? I don’t think so. 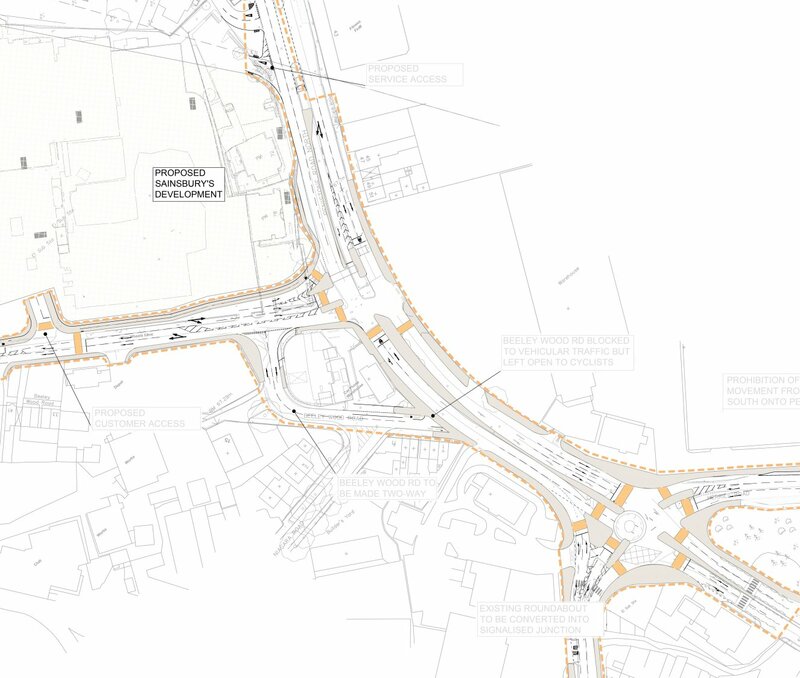 I’ve had a read through the report on which your basing your decision and am concerned that it doesn’t mention any of the concerns raised about the design of the scheme by CycleSheffield. This scheme was brought to the Cycle Forum in 2011, however it was made clear in the meeting that the cycling provision plans presented were just a ‘first stab’, it was brought to the forum to seeking opinions on preliminary designs. Forward on to a couple of months ago, you and I met and spoke briefly in Hillsborough at a Fair Deal petition event, you mentioned that there was a scheme to signalise this junction. I’d not seen any designs or heard any discussion, nothing further had been brought to the Cycle Forum, so I asked the council to send me the latest designs for cycling provision in the scheme. I was pretty shocked at what I received and sent the drawings around to some other cyclists in Sheffield, it seems that none of us were aware of the proposed design and it came as a bit of a surprise. The report you have states that “the detailed design of the this scheme has been subject to a further public consultation exercise” however this consisted of paper questionnaires being distributed to local businesses and residents, there was no wider consultation of the detailed design and it has not been brought to any recent Cycle Forum meetings. 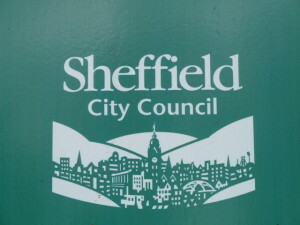 On 19th April the Chair of CycleSheffield, sent our collective comments and concerns to [the cycling officers at the council]. This list is compiled from a long discussion that took place on the design between members of CycleSheffield and represents the views of many cyclists in Sheffield. 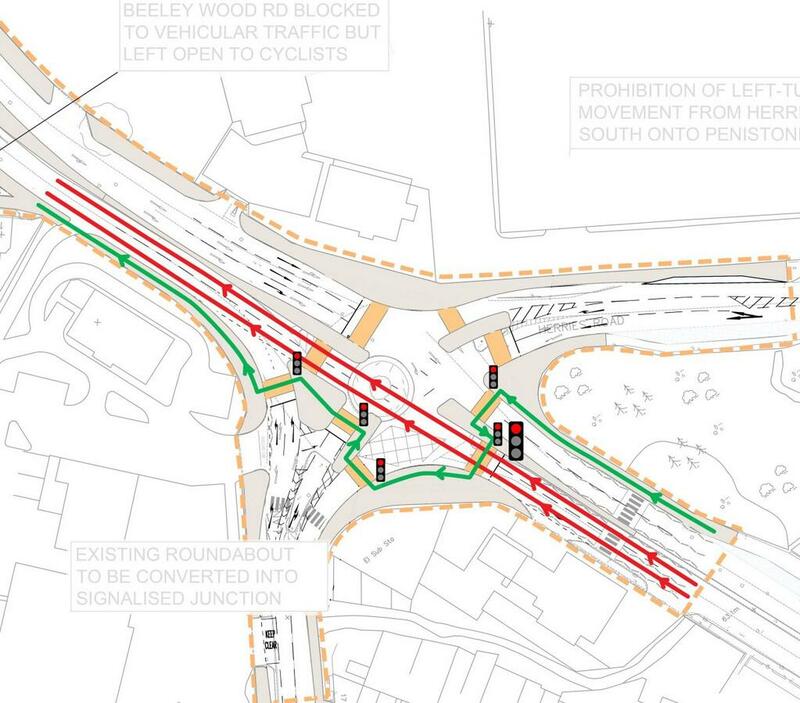 None of these comments and concerns have made it into the report which you will use to make your decision, neither has a plan of the proposed routes for bicycle traffic through these junctions. I think that you need to be made aware that I (and others) view this scheme as a complete failure for both walking and cycling. Your report, paragraph 4.6 states that “No significant outstanding concerns now exist” I believe this to be an inaccurate statement. One significant problem (out of the many below) is the inconvenience of the bicycle and pedestrian routes to the new store and through the two junctions. I have created some drawings to illustrate this and have attached a three of them to this email. The first drawing I’ve attached shows a comparison between the road and cycle route when turning right into Clay Wheels Lane (the entrance to the new store) from Penistone Road North. It shows that there is a single traffic light to wait for on the road route, but there are 5 separate crossings for the equivalent bicycle and pedestrian route, all with lights to wait for. The second and third drawings show the bicycle route when travelling from Penistone Road North through both junctions to join Penistone Road (and on into town past Hillsborough). The bicycle route has 7 separate crossings all with individual lights whereas the road route only has 2 traffic lights to pass though (which will likely be green 60-70% of the time). There are two arms of Leppings Lane junction which currently have zebra crossings, these provide priority and convenience to people who choose to walk to the store. The proposed designs converts these into toucan crossings, instead of a single crossing one will have two stages and the other will have three stages (5 in total to cross two adjacent arms of the junction). These new crossings will not respond to button presses when someone is waiting, they will be phased into the whole junction in order to keep traffic flowing. Putting safety concerns about zebra crossings aside, moving from a road crossing that prioritises pedestrians and encourages walking to one that prioritises road traffic and encourages driving is a backwards decision that needs to be reviewed. Your report states in para 3.4 that “The proposals are also aimed at improving road safety for those people who choose to walk or cycle to the new store” however I doubt many people will choose to walk or cycle to the new store because the details in the design make these modes of transport so inconvenient. If I had a car, I would use it to get to the store, there is very little about the design of this scheme that would persuade me to cycle or walk, it is far more convenient to drive. Bearing this in mind, I think that the design of the junction fails to meet the needs of all road users. The needs of motorised traffic are placed well above the needs of bicycle and pedestrian traffic. I suspect the design of the routes for pedestrians and cyclists were added after the routes for motorised traffic were already in the final stages of the design. They have been placed to suit the needs of the motorised road traffic, not designed to meet the needs of cyclists and pedestrians. I don’t think this is the way we should be designing highway schemes in Sheffield, we need to do all we can to reduce the reliance on private cars so that we have a positive impact on climate change, on air quality, on congestion, on the livability of our city and for the health of us all. I’m sorry that this email is so long, but I think all these issues need explaining clearly and fully, I hope you’ve made it this far! I would like for you to not approve this scheme design and send it back to the drawing board for a redesign, I will be coming along on Thursday to ask you to consider doing this and will talk on the points above. Please give me a call if anything isn’t clear or you’d like more information. This entry was posted in council, cycling, Penistone Road on May 11, 2013 by Matt.